-6 days: so, what's the plan? This is a question everyone asked me. Should be easy to answer considering I’m leaving in 6 days, right? Well, I didn’t plan my trip too much to keep it as much open and free as possible. 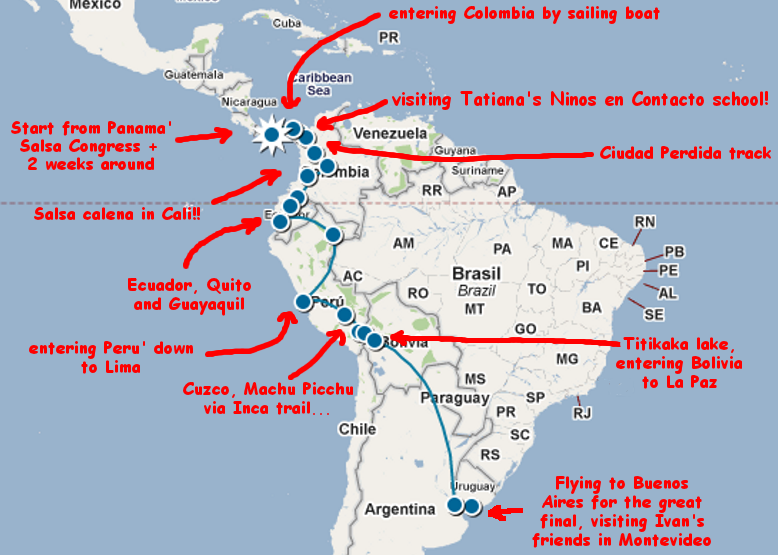 Having say that… the map below is the “concept” of the itinerary I have in mind. It can change, it can become shorter, longer, who knows now. This completes my 12 weeks available, giving focus on Colombia, Peru’ and Buenos Aires that are the places I’m more interested in at the moment. Awesome plan!! Sounds like fun!! For the big finale, you could change salsa for TANGOOOO!! Gooooo Daniele!!! But do take your laptop so you can keep us updated!! As long as you keep us posted!